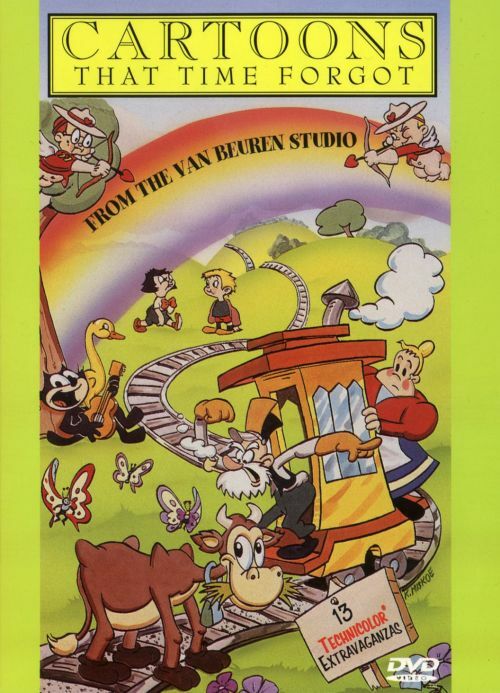 "Molly Moo-Cow and the Butterflies"
"Molly Moo-Cow and the Indians"
"The Goose That Laid the Golden Egg"
"Molly Moo-Cow and Robinson Crusoe"
"Molly Moo-Cow and Rip Van Winkle"
The cartoons of the Van Beuren studio are certainly among the lost treasures of American theatrical cartoons. But thanks to this DVD they no longer have to remain lost. 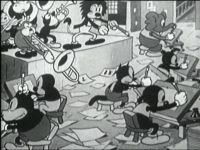 This little-known studio began with a series of cartoons called Aesop's Fables, and later created characters such as Cubby Bear and Tom & Jerry (a tall & short human duo, not the cat and mouse). Those B&W cartoons were mostly very crude and had little going for them, but a few of the best are included on this disc. The Van Beuren studio really hit its stride however when it hired away director Burt Gillett from Walt Disney. Gillett was the man who directed Disney's phenomenal hit "The Three Little Pigs", and it was hoped that he could equal that success at VanBeuren. He began a new series of Technicolor cartoons under the title of "Rainbow Parade". While most of his cartoons weren't as good as his Disney hits, there were many charming and delightful entries with well-told stories and very good animation. 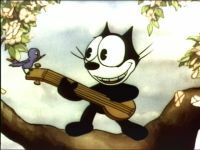 Felix the Cat was brought out of retirement and starred in a few of the Rainbow Parades, as did a new character called Molly Moo-Cow. 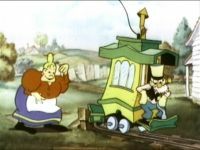 Rights were bought to the popular Toonerville Trolley comic strip, and some very good cartoons were made starring those characters. But just as the Van Beuren cartoons were making a name for themselves and increasing in popularity, their distributor -- RKO Pictures -- signed a deal to distribute Disney's cartoons, and the Van Beuren studio went out of business. These cartoons haven't been seen much in recent years, but the best of these classics are now available on this DVD. I normally don't like watching too many cartoons in a row, but once I started this disc I had to watch it all the way through. I don't know exactly what it was about these cartoons that appealed to me so much, but I have to admit that I truly enjoyed watching the adventures of Molly Moo-Cow and the Toonerville Trolley. Your own opinion may bee different, but I honestly consider some of these cartoons to be classics. Considering that this disc is comprised of public domain prints, the video and audio quality of these cartoons is excellent. The Technicolor cartoons in particular look very good, with the unfortunate exception of "The Sunshine Makers". The print for "The Sunshine Makers" is old and worn, which is a shame because it may be the best cartoon on the whole disc. Every copy of this cartoon that I've seen uses this same print, so it may very well be the only one available. One can only imagine how bright and vivid the colors must have been when it was originally shown in theaters. 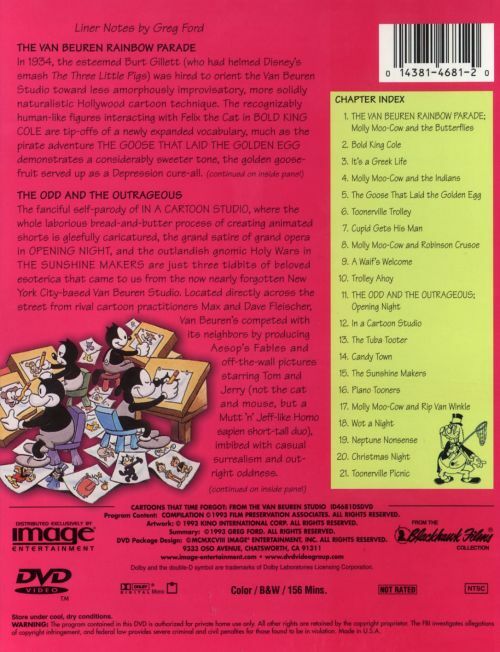 Though most of the cartoons on this disc are presented in their original form with their original titles, some of the cartoons use TV re-issue prints, and some have been renamed. These titles are: "In a Cartoon Studio" (originally called "Making 'Em Move"), "Candy Town" (originally called "Silvery Moon"), "The Sunshine Makers", "Wot a Night", and "Christmas Night" (originally called "Pals"). The cartoons themselves seem to be intact, and I only mention this because some people are very picky about cartoons using their original titles. The cartoons on this disc have been available as two VHS tapes or one laserdisc set, either of which would have set you back $50. Considering how enjoyable these cartoons are, the generally good video and audio quality, and the great value, I highly recommend this disc to anyone who loves cartoons.